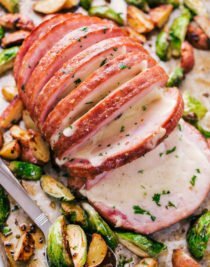 Cheese Stuffed Honey Baked Ham with roasted brussels sprouts and potatoes is an incredible meal to turn any occasion into a sensational occasion. 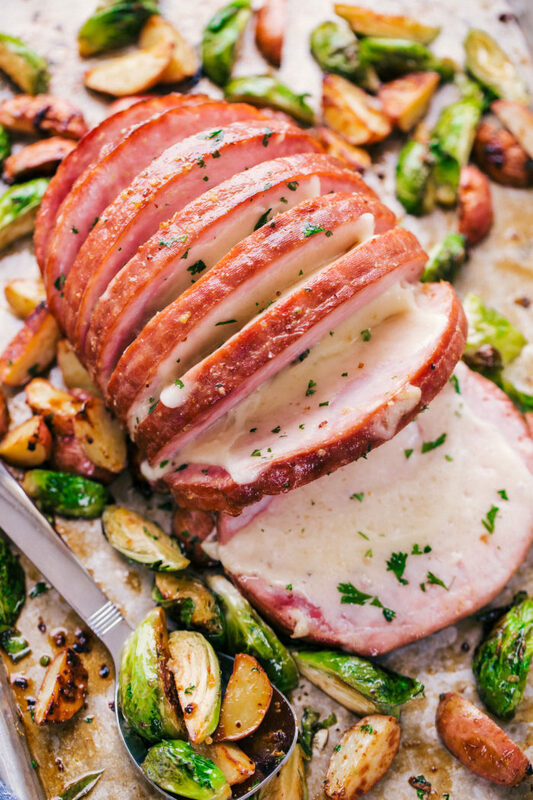 Holy ham bone, this Cheese Stuffed Honey Baked Ham is the real deal! 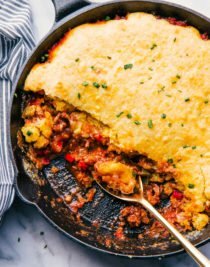 Not only is it sensational tasting it really is easy to make and it will definitely make an impression upon whomever is lucky enough to eat it. One of my favorite things about this honey baked ham is the Havarti cheese. It sets the tastebud tempo from the start. Warm and gooey coupled with a honey butter mixture, it’s a must get in my belly kind of moment. How do you make your ham sweet? In a bowl mix together melted butter, honey, stone ground mustard, garlic salt and pepper. Using a basting brush, cover the ham with the butter mixture. Roast the ham at 400 degrees covered in foil for 40 minutes, the last 10 minutes uncover ham until done cooking. The outside should be slightly caramelized giving it that great sweet flavor. 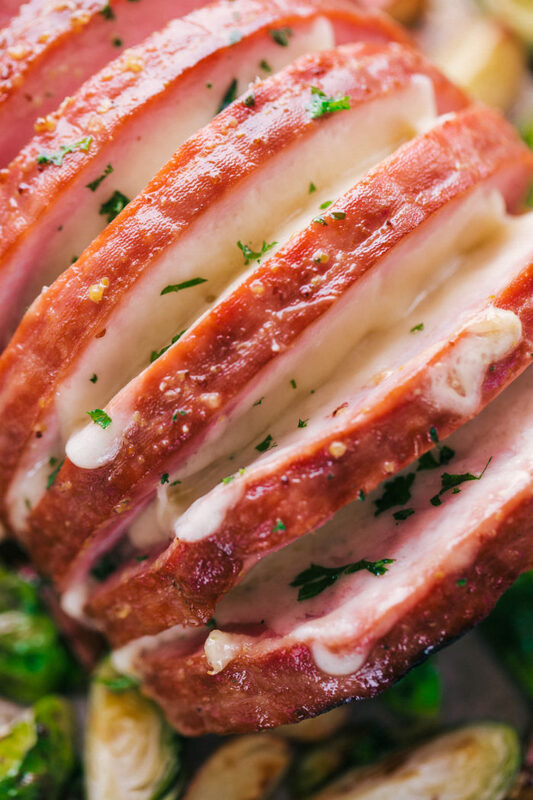 This Cheese Stuffed Honey Baked Ham is a one hit wonder. The addition of the cheese is really what takes it over the top. The salty and creaminess of the cheese goes so well with the sweetness of the honey butter combination. Why havarti cheese you ask? It has a buttery yet lightly sweetened flavor that compliments the ham and also gives it a buttery texture. How do you make Cheese Stuffed Honey Baked Ham? This Ham is really very easy to make so lets get started. Preheat the oven to 400 degrees and prepare a rimmed sheet pan and place two pieces of foil over the pan, one horizontally and one vertically. Place ham on a cutting board and cut into 6 slices, without cutting all the way through to the bottom. Place ham in the center of the sheet pan on the foil and put one piece of cheese in each cut. In a small bowl whisk together melted butter, honey, mustard, pepper, and garlic salt. Brush mixture all over ham until well coated and tightly seal by pulling up all four sides of the foil and tightly covering the ham completely. Roast for 20 minutes. With the remaining butter mixture toss the vegetables and potatoes and add them around the ham and roast an additional 20 minutes, uncover the ham the last 10 minutes of cooking. Cut the slices all the way through and serve warm. Rather than using havarti cheese you can use cheddar, swiss, or mozzarella cheese. In addition to the cheese you can also add a little heat with sliced jalapeños or even a spicy or sharp flavored cheese. Either way you will make one delicious ham that will make any occasion a sensational occasion. 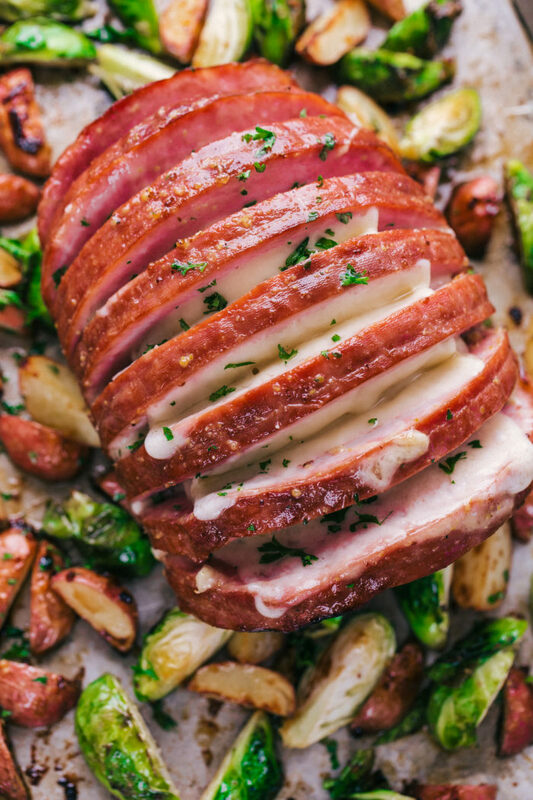 So when your occasion calls for a ham and you want to make it a little more extraordinary, try this Cheese Stuffed Honey Baked Ham. Cooking doesn’t have to be hard, but it should be delicious. 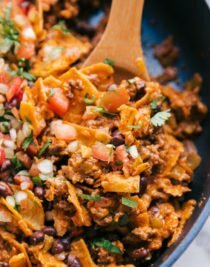 Looking for a few more simple and delicious recipes to try? Preheat oven to 400 degrees and spray a rimmed sheet pan with nonstick spray. Line the tray with 2 pieces of foil, one running horizontally and the other vertically. On a cutting board, cut ham into six slices, but do not cut all the way through to the bottom. Place ham in the middle of the prepared sheet pan and place one slice of havarti cheese in each cut. In a small bowl combine melted butter, honey, mustard, pepper, and garlic salt. Brush mixture all over the ham and then cover ham completely and tightly with pieces of foil. Roast for 20 minutes. With the remaining butter mixture toss the brussels sprouts and potatoes. Add them to the tray around the ham and roast another 20 minutes. The last 10 minutes uncover ham and finishing cooking. Garnish with parsley and sever warm.